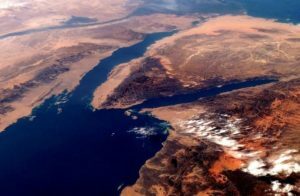 Red Sea or Reed Sea: Where is Mount Sinai? This week’s parasha, Beshalach, recounts the Splitting of the Sea. It is common knowledge that this was the Red Sea, called yam suf in Hebrew. Yet, in recent decades scholars have tried to “debunk” that notion, preferring to associate yam suf with a smaller lake of some sort. They often start by pointing out that yam suf literally means “sea of reeds”. It is the Reed Sea, not the Red Sea. There are indeed several shallow, marshy lakes with reeds in that vicinity of Egypt, around the modern Suez Canal. The fact that the Torah speaks of the “Reed Sea” being near places like Pi-Hahirot, whose location is believed to be known, is used as further proof of yam suf not being the Red Sea. Of course, this serves to diminish the great miracle of the Splitting of the Sea. It almost implies that the Israelites waded through a shallow lake, as opposed to crossing a vast expanse. The reality is that such a hypothesis does not at all fit with the descriptions we receive in the Torah. A careful look reveals what yam suf actually is, and further helps to locate an even bigger prize: Mount Sinai. A Sea or a Lake? From the Torah’s description of the Splitting of the Sea, we learn that the waters stood as large walls to the left and right of the Israelites, and that the Egyptians later drowned in its depths (see, for instance, Exodus 14:28-29, 15:4, 8). This implies a deep sea, not a shallow, marshy lake. Yam suf is mentioned well over twenty times in the Tanakh. When going through these verses and their context, one will find that it is a major geographical entity, not a small lake. For example, Numbers 14:25 says that the Amalekites and Canaanites live near yam suf, while Numbers 21:4 says the Edomites are near it, too. If it was a small lake somewhere in the Sinai Peninsula, or by the Suez Canal, this wouldn’t make much sense. In fact, the land of Edom is known to be in the area of what is today the Negev desert, roughly southern Israel and Jordan, going down to what is today Eilat. This is confirmed by I Kings 9:26, where we read that “King Solomon made a navy of ships in Etzion-Geber, which is beside Elot, on the shore of yam suf, in the land of Edom.” King Solomon built a navy-yard in a port near Elot (אֵלוֹת), undoubtedly related to today’s Eilat. And, like today’s Eilat, is in on the shore of yam suf, the Red Sea, in the land of Edom. This verse solves the entire puzzle. 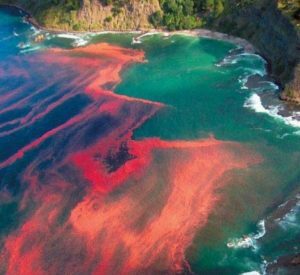 Scholars wonder why the sea became known as the Red Sea, when the answer might be right there in the Torah: to the Israelites, this was the sea by the land of Edom, which literally means “red”. It was the Edomite Sea, the “Red Sea”. And it is the selfsame body of water as yam suf. On that note, some have proposed that is isn’t yam suf, but yam sof, literally the sea “at the end”, since it is at the southernmost tip of Israel. Yet another idea is that it is yam sufa, “Storm Sea”, referring to the great wind storm that God sent to part the waters (Exodus 14:21). Whatever the case, there is little doubt that the Israelites did indeed cross what we know today as the Red Sea. The bigger question is: where exactly did they cross? Some believe that the Red Sea got its name from the red blooms of sea sawdust, Trichodesmium erythraeum (a type of cyanobacteria), that occasionally happen there. It is commonly thought that Mount Sinai is somewhere in what is today called the Sinai Peninsula. In fact, back in the 6th century, Christians built a monastery on a mountain in the Peninsula which they believed to be Sinai. It still operates today as Saint Catherine’s Monastery, and is among the oldest Christian monasteries in the world. The only problem is that it isn’t anywhere near the real Mt. Sinai. The Torah famously tells us that Moses saw a burning bush during his first encounter on the “mountain of God”. In Hebrew, it is called a s’neh, which gives rise to the name Mount Sinai. This mountain is in the wilderness around Midian, in a land call Horev. Later on, the Israelites cross the Red Sea and journey towards this same mountain, where they receive the Ten Commandments. 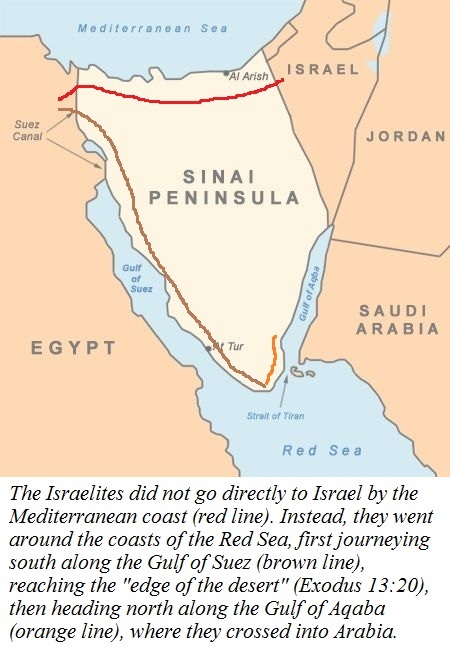 This implies that the Israelites crossed somewhere in the Gulf of Aqaba, ending up in what is today Saudi Arabia. This makes all the more sense since they can journey from there to the wilderness “on the other side of the Jordan”, where they spent forty years before crossing the Jordan River—from the East—into Israel. The Talmud supports the notion that Sinai is in Arabia. We read how Rabbah bar bar Chanah—famed for his adventurous tales—was “once traveling in the desert and was met by an Arab merchant… he said to me: ‘Come and I will show you Mount Sinai.’” (Bava Batra 73b-74a) Bar bar Chanah goes on to say that he followed the Arab to the mountain, and heard a Bat Kol, a voice emanating from Heaven. Having said that, it must be mentioned that the Sages often rejected bar bar Chanah’s tales because they thought he made them up! We learn from this that God did not lead the people directly along the coast of the Mediterranean to the Holy Land, which would have been the fastest and straightest route. This would have taken them through the coastal lands of the Philistines, and the Israelites would have feared them. So, God led them roundabout, along the coasts of the Red Sea in what is today the Sinai Peninsula. We are told that the Israelites “travelled from Succoth, and they encamped in Etham, at the edge of the desert.” (Exodus 13:20) This means they went all the way down to the tip of the Sinai Peninsula. Fittingly, God then told them “turn around and encamp in front of Pi-Hahirot, between Migdol and the sea; in front of Baal-Tzfon, you shall encamp opposite it, by the sea.” (Exodus 14:2) Having journeyed south all the way to the “edge”, they were now being told to turn around and head back north, along the eastern coast, “by the sea”. At this point, Pharaoh’s informers told him the Israelites were “confused” and lost in the desert (Exodus 14:3), and he thought he had a chance at revenge. Pharaoh and his chariots pursued the Israelites and trapped them along the Gulf of Aqaba. The Red Sea split, and the Israelites crossed the narrow gulf into Arabia, where they later received the Ten Commandments at Sinai. The narrative of the Ten Commandments is in parashat Yitro, because it begins with Jethro joining up with Moses and the Israelites. This further proves that Sinai is near Midian, in Arabia, and not in what is today called the “Sinai” Peninsula. 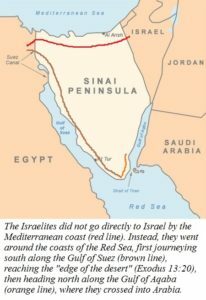 To summarize: yam suf is indeed the Red Sea, the Israelites most likely crossed the Gulf of Aqaba, and the best candidate for the location of Mount Sinai is in Saudi Arabia. It may be Jebel Musa, or perhaps another mountain unknown to anyone. It may not even be there at all, for as we’ve written in the past, one tradition has it that Mount Sinai descended to this world only to be the vessel for delivering the Torah, and has since disappeared. This entry was posted in Archaeology & History, Mysteries & Origins and tagged Arabs, Bava Batra, Beshalach, Book of Kings, Edom, Egypt, Eilat, Gulf of Aqaba, Jebel Musa, Jethro, King Solomon, Midian, Miracles, Mt. Sinai, Pharaoh, Rabbah Bar Bar Chanah, Red Sea, Saudi Arabia, Sea of Reeds, Sinai Peninsula, Splitting of the Sea, Suez Canal, Yam Suf on January 14, 2019 by Efraim Palvanov. Should We Still Be Praying for Mashiach? This week’s Torah reading is Beshalach, centered on the climactic narrative of the Splitting of the Sea. We read that following the Exodus, the Israelites are walking towards the Promised Land before suddenly being told by God to turn back. 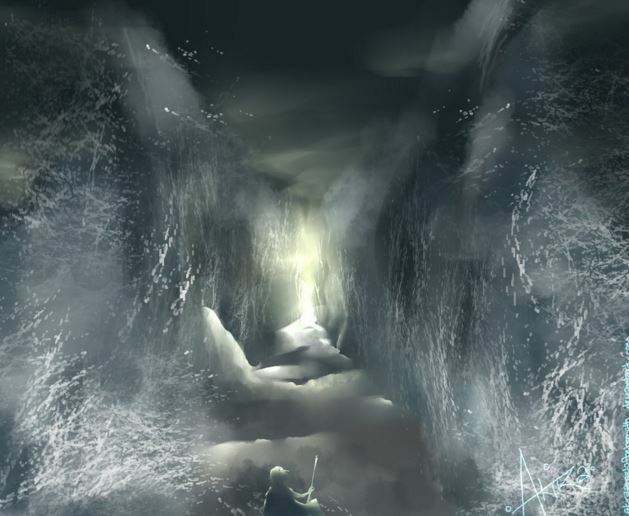 Soon, they find themselves at an outcropping near Yam Suf, the “Reed Sea”. Meanwhile, Pharaoh’s spies have informed him that the Israelites appear to be coming back to Egypt. Seeking his revenge, Pharaoh summons all the chariots of Egypt (led by 600 of the choicest officers) to obliterate the Israelites. Stuck between a rampaging military on one side and the sea on the other, the Israelites panic. We know how the story ends, of course, with God sending the greatest of His miracles in the nick of time, splitting the sea in two, allowing the Israelites to pass through unharmed, and drowning the Egyptian charioteers that attempt to follow. Commenting on these verses, the Sages tell us that there were actually four types of Jews among those Israelites. The first group immediately fell into a fright and were so paralyzed by their fear that they were unable to do anything. The second group were the weak-spirited ones who immediately decided to surrender and return to Egypt. The third group were the brazen warriors who took up arms to fight the Egyptians to the death. And finally, the fourth group were those who started to pray fervently. Moses addresses all four groups: “Don’t be afraid! Stand firm and see Hashem’s salvation that He will do for you today, for the way you have seen the Egyptians today, you shall never see them again for eternity. Hashem will fight for you, and you shall remain silent.” (Exodus 14:13-14) To those who feared, Moses said not to be afraid. To those who wanted to return to Egypt, he promised they would never see the Egyptians again. To those that wanted to do battle, Moses reminded them that God will do the fighting for them. And to those that prayed, Moses said to be silent. It is easy to understand Moses’ command to the first three groups. Why fear after all that God had done for them? Why return to Egypt when God had already brought them so far? Why battle when God had battled on their behalf? But what of the fourth group? What’s wrong with offering a prayer at such a difficult moment? Does it not show their faith in God? Indeed, although Moses silenced those who prayed, the following verse tells us that he himself prayed! And then it was God who silenced Moses! Why was God not looking for their prayers at that moment, and what was He looking for? The Talmud (Sotah 37a) fills in the details of what was going on at the time. God told Moses to stop praying, and Moses replied: “What is there in my power to do?” Moses felt powerless at that moment, and was waiting for God to act. God, however, was waiting for His people to make a move. Thus far, He had done everything for them. He had brought the plagues upon their tormentors, took them out of Egypt with riches and fanfare, and had proved beyond any reasonable doubt that He exists and protects His people. Now, God was telling them: v’yisa’au, “go forth!” Cross the sea. Yet, the people stood still, as did Moses. Where was their faith? Did they not understand by now that God would never abandon them, or let them perish? Did they not recognize that everything had gone exactly as God had commanded? If God directed them to go into the sea, that is what they needed to do! This was not a time to pray, but a time to act. One person did understand this. His name was Nachshon ben Aminadav, the prince of the tribe of Judah. He realized that if God commanded them to cross the sea, than that is exactly what they needed to do. And so, he marched on into the waters, and as he did, the waters parted before him. The Talmud states that only at this point did God tell Moses to lift up his staff and keep the waters parted. It sends shivers down one’s spine to read these words, composed over 1500 years ago, that ring so true today: A world of abundance, yet so many hungry mouths. Corrupt government, and no one to stop it. Places of scholarship are places of immorality – a fitting description for most of today’s university campuses – and an increasingly atheist society despising those who fear sin. A world so full of information, yet ironically so full of ignorance and mistruth. A generation that resembles a dog: animalistic, licentious, unashamed. And there is no one to rely upon, save for God. Years ago, I heard a powerful interpretation of this passage. Unfortunately, I cannot recall in whose name it was cited, but it went something like this: The last phrase in the passage – that there is no one to rely upon except for God – is also part of the list of things signifying the footsteps of Mashiach. In other words, it’s not that the Sages are listing a whole bunch of things wrong with the world, then concluding by saying there is no hope, but rather, the fact that people think there is no hope is also part of the list of things wrong with the world! When we come to the point where we think nothing can be done, and we must only pray to God, that in itself is a failure on our part. The truth is, there is much to be done, and each person has an unlimited potential to make a difference in the world. If we really do want to usher in the era of Mashiach, we must remember that two thousand years of praying for it has not worked. Just as it was with the Israelites by the Sea, now is not the time to focus on our prayers, it is time to focus on our actions. This entry was posted in Mashiach & End of Days, Personal Development and tagged Aaron, Action, Beshalach, End of Days, Exodus, Footsteps of Mashiach, Mashiach, Moses, Nachshon, Peace, Prayer, Prophecy, Red Sea, Reed Sea, Splitting of the Sea on January 21, 2016 by Efraim Palvanov.